These stunning fruit flavours are enrobed in the finest chocolate. Presented in a stunning gift box. This gift box also comes in Rose & Violet, Espresso Martini Cocktail and Strawberry & Marc de Champagne – Click to view. Ingredients: White Chocolate (Sugar, Cocoa Butter, Whole Milk Powder, Emulsifier: Soya Lecithin, Natural Vanilla), Dark Chocolate (Cocoa Mass, Sugar, Cocoa Butter, Emulsifier: Soya Lecithin, Natural Vanilla), Milk Chocolate (Sugar, Cocoa Butter, Whole Milk Powder, Cocoa Mass, Emulsifier: Soya Lecithin, Natural Vanilla), Fondant (Sugar, Glucose (Wheat), Water, Preservative: Sulphur Dioxide), Butter (Milk), Fruit Purées (Glucose Syrup, Invert Sugar Syrup, Strawberries, Orange, Apple & Beetroot Juice Concentrate, Natural Flavourings, Ethanol, Acidifier: Citric Acid, Colouring Plant Concentrates (Apple, Safflower, Lemon, Carrot & Pumpkin)), Strawberries, Raspberries, Natural Flavourings (Apple, Blackcurrant, Raspberry, Strawberry), Natural Colourings (Beetroot Red, Spirulina), Citric Acid. For allergens, including cereals containing gluten, see ingredients in bold. May contain nuts and peanuts. Thank you for contacting us. We are pleased to know that you love our Handmade Chocolates. 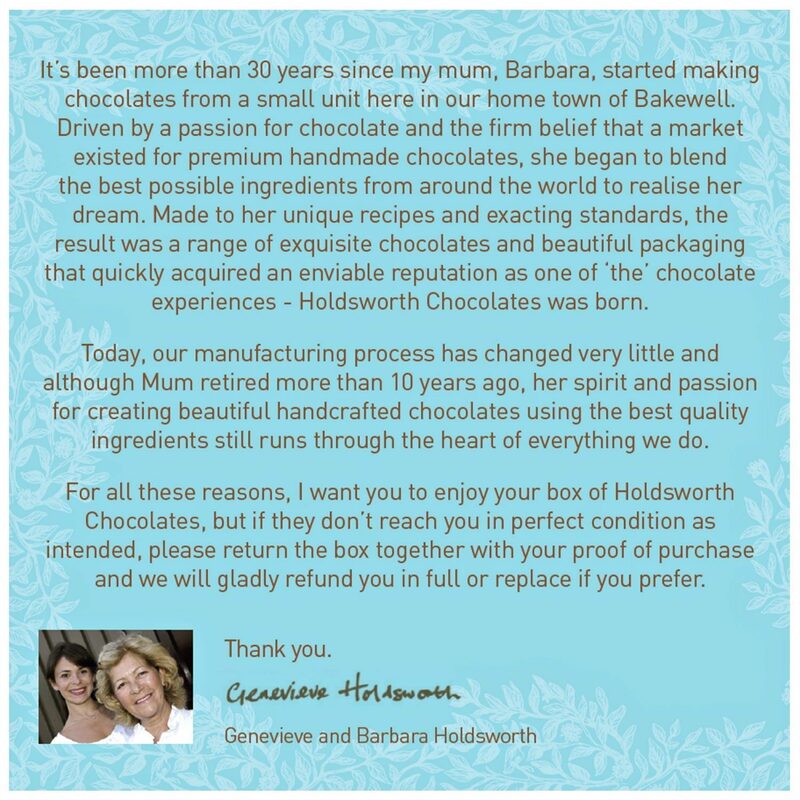 We are a small family run business so we appreciate all the lovely comments, we try our best to give you an exquisite chocolate experience! Thank you again for taking the time to contact us. My wife loved these at Christmas which has left me hunting them again in local shops to no avail. Time to order direct! We have tried a range of Holdsworth chocolates and they are all delicious. Thank you. Found a box of these in TJMAXX in America. All 3 flavours are quite lovely. Highly recommended.